Some people love the idea of planning for a wedding. I am not one of those people. I understand that it is a magical day that you will remember for the rest of your life, but somehow I don’t think that 40 years from now you are going to remember what kind of flowers were in the centerpieces on your wedding tables. I’d rather just kick back with friends and family members and not worry about planning out every last detail. I am lazy that way. Carnival Cruise Lines has some options available to both lazy people like me and those who want to plan the perfect wedding. 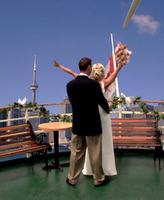 They have a number of packages available to make it easy for you to get hitched on one of their cruises. It could be lovely. The sun setting over the water while you say your vows in front of the people you care about. Or it could be a nightmare with seas running at 25 feet and everyone throwing up overboard. Either way it will be memorable and that is what a wedding is supposed to be even if you can’t remember the centerpieces forty years later.